I’ve always said in recent years that the only thing keeping me interested in the Windows platform was OneNote. Over the past five years or so I’ve gradually re-invested in the Apple platform after abandoning it for the Windows machines of various 1-1 notebooks programs over the years including Toshibas, ACER, Fujitsu, IBMs and others. I bought an iPod, then an iPhone and an iPad and then a Mac Mini. Back to the Mac; since my first computer at work was an Apple 2, and the first computer I bought was an Apple 2C, so sleek and modern at the time. I had a Mac Classic all those years ago. 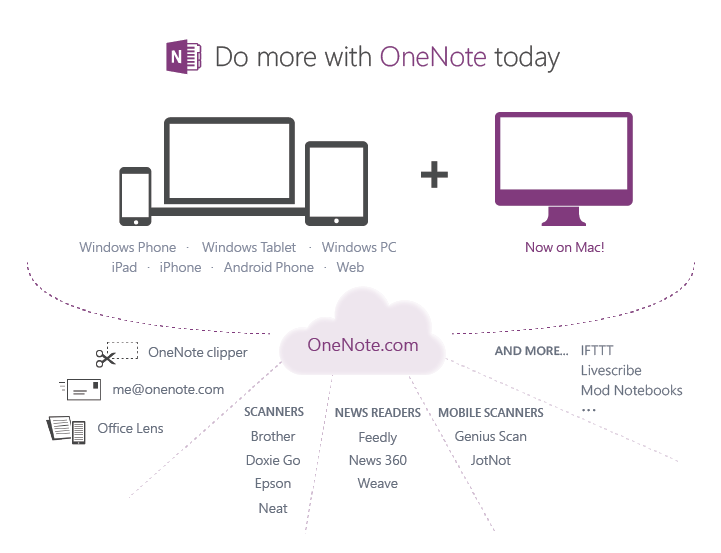 So I was pretty interested to see Microsoft finally release a Mac version of OneNote this week. At last! And free! OneNote has been my favourite Microsoft Office component on Windows for a long time, (it’s my central teaching tool) and now it’s on the Mac, syncing via OneDrive. The Mac version isn’t quite as full-featured; is pretty light on features: it lacks tight integration with Outlook, for example and I can’t see sub-sections or a way to move stuff around. But it’s finally there and a worthy developing competitor of Evernote at last. It’s on the Mac App Store and went to No. 1 straight away. Makes me want to go out and buy a Macbook, which I’m sure isn’t exactly what Microsoft intended!